There was no lack of fan interest in the pennant races in 1908. Baseball fans were immersed in two of the great pennant races in modern history. As the curtain came down on September, no fewer than six teams, three in each league, had a shot at the league pennant in 1908. In the NL, mere percentage points separated the New York Giants (93-53-3, .637) and the Pittsburgh Pirates (95-55-1, .633). A half-game behind them were the Chicago Cubs (94-55-4). In the AL, the race was just as tight. Detroit (87-61-1) led Cleveland (87-62-2) by a half-game. The Chicago White Sox (85-62-4) were not far behind, sitting in third place a game and a half behind Detroit. The Tigers certainly had the hot hand. They were on an eight-game win streak as the St. Louis Browns visited Bennett Park for a two-game series. Cleveland, which had won four games in a row, hosted Chicago at League Park starting on Friday, October 2. The pitching matchup in the first game of the series was a dandy. Ed Walsh was throwing for the visitors and Addie Joss for the Naps. Incredibly, Walsh entered the game with a 39-14 record. Big Ed put together a 23-5 record at Chicago’s South Side Park. However, at League Park, Walsh had yet to win a game, and was 0-3. In two of those losses (April 21 and September 7), he went up against Joss. Joss was certainly a worthy adversary. He entered the game with a record of 23-11. Joss was a superb control pitcher, striking out 122 batters while walking 29 to this point in the season. As Joss finished his warm-up pitches, he strolled around the outfield and spotted Walsh sitting by himself on the White Sox bench. Joss took a seat next to Walsh, and the two pitching greats had a quiet conversation. A photographer snapped a picture of the two hurlers, sitting side-by-side as if they were in a city park and not preparing for one of the biggest games of the season.4 A season that had now shrunk to five games. Joss and Walsh each retired their opponents in order in the first inning. Joss, in fact, set down the first nine batters he faced. In the bottom of the third, the breaks went the Naps’ way. Cleveland center fielder Joe Birmingham led off with a single to right field. 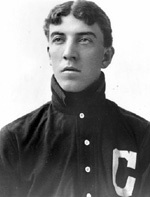 As he edged off first base, Walsh turned and fired the baseball to first baseman Frank Isbell. Birmingham was caught leaning toward second base, and he took off. Isbell’s throw to second to get Birmingham struck him in the back and ricocheted into center field. With the crowd screaming hysterically, Birmingham reached third base standing. George Perring, the Cleveland shortstop, bounced out to his Chicago, counterpart, Freddy Parent. Birmingham held at third while Joss came to the plate. The Cleveland ace unsuccessfully tried to lay down a bunt three times and struck out. Walsh whiffed leadoff hitter Wilbur Good as well, but the third strike crossed up White Sox catcher Osee Schrecongost. The baseball sailed out of the backstop’s reach, although he made a valiant effort to grab it with his bare hand. A crushed finger was all he got for his effort. Birmingham crossed home plate to give the Naps a 1-0 lead, and Walsh was charged with a wild pitch. Schrecongost was eventually removed from the game and replaced by Al Shaw. Joss bore down against the White Sox. In the fourth, second baseman Napoleon Lajoie had a hand in all three putouts, two of the groundball variety that he assisted on and one on a short fly ball. In the fifth, Joss fielded a grounder off the bat of Parent that squibbed toward the third-base line. Joss wheeled and threw a bullet to first for the out. Walsh was just as tough, atoning for the wild pitch in the third frame. Big Ed mowed the Naps batters down. Walsh was striking out two batters an inning, but his mates could not get to Joss. Birmingham led off the bottom of the eighth inning by hitting a slow roller to Chicago second sacker George Davis, and Birmingham beat the throw by a step for his second hit of the game. He made it as far as third base, where he was left when Good struck out for the fourth time. Joss stepped to the hill in the top of the ninth inning. Doc White led off, pinch-hitting for Shaw and grounded out to second. Up stepped Jiggs Donahue, batting for third baseman Lee Tannehill. Joss struck him out for his third and final strikeout. Chicago manager Fielder Jones went to his bench again, sending John Anderson to bat for Walsh. Anderson gave the home crowd a reason to gasp when he sent a line drive down the left-field line that fell just foul. He followed that near base hit with a groundout to third baseman Bill Bradley. The fans sent a rousing cheer into the autumn air. Joss had just thrown the second perfect game in the American League. The first had been thrown on May 5, 1904, by Cy Young of the Boston Americans. Walsh struck out 15 batters, a career high he equaled in 1910, and walked one batter. His record fell to 39-15. Joss, who needed to throw only 74 pitches for his masterpiece, raised his record to 24-11. He struck out three, walking none. The game was played in 1:40. The next day Chicago nipped the Naps, 3-2. Walsh picked up his sixth save. With the loss, Cleveland fell to 1½ games behind Detroit. The Tigers finished the season in Chicago, and dropped two of three to the White Sox. Cleveland ended the year in St. Louis. The Naps claimed two of three wins, and finished a half-game behind Detroit. The Tigers met the NL champion Chicago Cubs in the World Series. The Cubs won their second straight world championship, both years besting Detroit. The author accessed Baseball-Reference.com for box scores baseball-reference.com/boxes/CLE/CLE190810020.shtml and other data, as well as retrosheet.org/boxesetc/1908/B10020CLE1908.htm. 1 Weather Report, Cleveland Plain Dealer, October 2, 1908: 2. 2 Scott Longert, Addie Joss: King of the Pitchers (Cleveland: Society for American Baseball Research, 1998), 96. 6 Henry P. Edwards, “Highlights on Friday’s Most Remarkable Pitching Battle,” Cleveland Plain Dealer, October 3, 1908: 6. 7 Henry P. Edwards, “What Joss and Walsh Say About It,” Cleveland Plain Dealer, October 3, 1908: 6.